Blank books provide a great way to encourage kids to write. Here are directions to make 3 different versions of blank books for your kids. Once you develop a system and get into a groove, assembling a pile of blank books is an easy project that can be done while binge-watching TV #hellonetflix. Here are 3 different versions of blank books that you can easily make for your kids. I have also included a little video tutorial for each of the methods below. I have included a few affiliate links at the bottom of this post for your shopping convenience. If you purchase something from a link, there will be no additional cost to you, but a small portion of your purchase will be used towards the cost of maintaining this website. When I volunteered in my son’s kindergarten class, his teacher often asked me to assemble a bunch of these mini books. She always had a stack of them in her writing center. I soon made a stack to use at home and we used them in our preschool writing center as well. I used a paper cutter to cut a bunch of letter-sized paper in half. You don’t have to use colored paper for the book cover, but I like to have a pretty cover. After cutting the paper, I grab one piece of color paper and two or three pieces of white paper. I fold them in half and staple on the crease. Now, these books are easiest to make if you happen to have a long arm stapler. But, I have also made hundreds of these with a standard stapler. All you have to do is roll the book pages a bit so that they fit under the stapler. When you are done stapling, you can unroll and smooth out any little wrinkles. If you have used any of the little books that I have created for my TPT store, you will recognize this book making method. Like the books above, this method will also result in a quarter-page sized book….and you might find that it is a little easier to staple. I sandwich 3 – 4 full sheets of white paper between 2 color sheets of paper. You will be using a paper cutter to cut these books, so you need to make sure to only use the number of pages that your cutter can handle. After making my little stack of papers neat, I staple the sheets 4 times along each long edge as shown. That’s a total of 8 staples. After making a bunch of these stapled sheets, I use a paper cutter to cut the sheets in half as shown. Then I cut the halves in half to create 4 little books. Tada! This final method creates a much smaller book, but it only uses one sheet of paper per book. I had made these little books before, but it wasn’t until I made them in a workshop that I discovered a really easy way to make them. Here is the easy method. Take that hamburger and fold the long sides together to make something that looks like a park bench. The folded edge is the back of the park bench. Use a scissors to cut the crease in back of the park bench only. Do not cut the seat of the park bench. Now, open the paper back up and fold it in half again with long sides together (hotdog fold). You will see an opening in the center as shown. Squeeze the sides together to squish that opening together to form the pages of the book. Then fold the whole book together. Because kids sometimes like to unfold this book, I like to add a staple to the center to hold them together. Writing Center – This is the most obvious place to house some blank books. 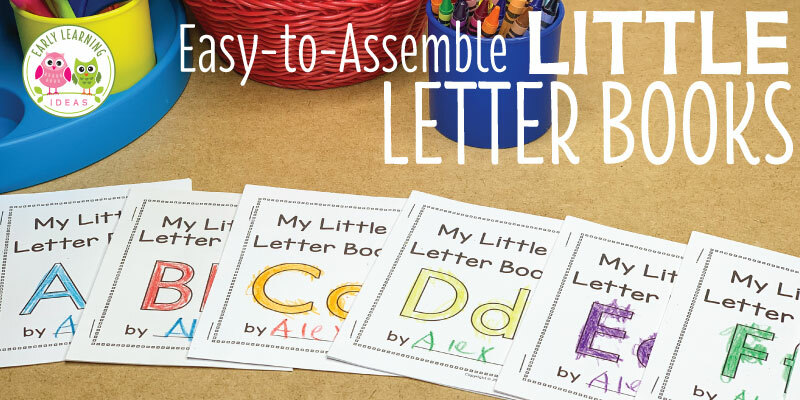 Kids can create books and can practice writing letters or thematic words. Science Center – Kids can make predictions or record observations. Dramatic Play Area – Kids can use them to make shopping lists, menus, scrapbooks, phone books, etc. Block Center – Place blank books in your block center so that kids can make a plan or blue print….or they can make a drawing of their structure. Math Center – Kids can practice representing numbers with drawings or stickers and they can practice writing numerals. Interested in some printable little books? Click on the images below to check out the resources in my store. I also like to make #3 type books from A3 paper: it is used in office photocopiers, and you end up with 2 different sizes of this book.